Is coffee good for you? Will sausages kill you? Should you avoid sugar, fat, salt, or all three? Booked your smear test yet? Checked your balls? Considering bariatric surgery? Are you taking statins like a good boy or girl? Or should you just ignore this relentless bombardment of medical advice and remember that no one gets out of life alive. 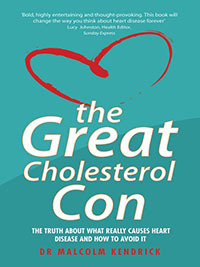 With the same brilliance and humour that bowled us over in The Great Cholesterol Con, Dr Kendrick takes a scalpel to the world of medical research and dissects it for your inspection. How the drug trials are hyped, the data manipulated, the endless games that are played to scare us into doing what, in many cases, makes the most money. After reading this book you will know what to believe and what to ignore. You’ll have a much greater understanding of the world of medical research. “It is simply no longer possible to believe much of the clinical research that is published, or to rely on the judgement of trusted physicians or authoritative medical guidelines. I take no pleasure in this conclusion, which I reached slowly and reluctantly over my two decades as an editor of The New England Journal of Medicine.” Dr Marcia Agnell. 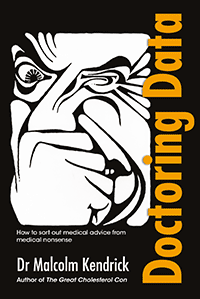 Doctoring Data is available in paperback the following online suppliers and from all great, UK, bookshops.